My touring bike was supplied with a Shimano Deore 48/36/26 chainset (with 175 mm cranks) and a Deore 11-32 9-speed cassette. I soon replaced the cassette with a Deore XT 11-34 and have just fitted a Deore XT M771 48/36/26 crankset: this 'trekking' crankset has wider ratios than M770 mountain bike cranksets with either 42/32/24 or 44/32/22. Out of curiosity I've analysed the gearing using our bicycle gear inch calculator. The gearings greyed out above are excluded. They are less usable because of the offset chainline. On the large chainring I've assumed the three smallest sprockets are usable. On the middle chainring I've allowed a spread of two sprockets either side of the middle one, and on the small chainring allowed four sprockets, not three. It seems to me (not proven scientifically) that the point at which the chain begins to bend sideways from the chainring is further back on the large chainrings, so the angle of offset is greater and fewer sprockets are thus available than from the small one. There is also the usual duplication; for instance (5) and (12) are both 64.82 gear inches and other combinations are close enough to be considered duplicates. That's the theory at least. There's probably a degree of laziness in (not) changing up to the large chainring when it's the most efficient selection. *Note from above: 26 / 26 is the same ratio as 1 / 1 (wheel diameter = 27.01 inches and 27.01 gear inches: direct drive) which seems to confirm the accuracy of the gear inch calculator. Posted by Patrick on August 11th, 2011. IMHO, ideally you should be able to get to that middle sprocket on your cassette from the large chain ring. I do and that is my ideal for cruising along (50/21 = 62.81 inches). I don't worry about duplicates, because that means you can be in your ideal gear on another chain ring (39/17 = 60.52 inches) and you spread the wear more evenly across the cassette. Your Ridgeback Panorama came with a Hollowtech crankset with external bearings. Ridgeback later changed the specification to a lower spec crankset with a square taper axle to give a better chainline. It's a pity that you feel able to use only the three smallest rear sprockets from the large chainring. Having said that, I only use the four largest rear sprockets from the small chain ring: I am concerned about chain deflection under load. I leave the smallest and largest rear sprockets alone when I'm on the middle chain ring. 48-11 is too big for me for practical purposes, although I have seen you using it on the flat, Patrick, but not at 90rpm :shock:. I use 16 of the gears available to me. Why did you replace the standard Deore chainset? Was it worn so soon or did you just fancy an upgrade? The upgrade... the drivetrain and hubs on my tourer are now all Deore XT and I'm going to fit the old Deore crankset to another bike. The weight difference between an external bearing BB (light) and a square taper one (heavy) is very noticeable even allowing for the fact that the XT axle is part of the crankset. I haven't taken very much notice of gear combinations in the past (as long as the chain offset isn't excessive) but I will from now on. 48-11 is for downhill so you're right: I can't ride at 31.57 mph on the flat! I seem to have a much narrower range of gears than either of you. Presumably closer gear ratios should enable me to always pedal at my optimum cadence although I doubt if I actually do and have absolutely no idea what my cadence is! Chainset TA Carmina, 165mm cranks, 46, 36, 26. Cassette Campagnolo Veloce, 13, 14, 15, 16, 17, 19, 21, 23, 26. This gives a spread of 27 – 95 inches. All of these gears are useable altho I obviously try to avoid too much crossover. I have sometimes found myself on the largest sprocket and largest chainring when I thought I was on the middle chainring! I only use the inner ring when touring with panniers, I can get up local hills comfortably on the 36, the Yorks ride would obviously have been a different story! This is the setup that Roberts recommended and I have been very happy with it. I initially thought that a 95" top gear would be too low but I've never felt any need for a bigger gear – I can only push 95" downhill with the wind behind me! Hilary wrote: All of these gears are useable altho I obviously try to avoid too much crossover. It shows the spread of the chainline for each of the three chainrings based on what seems the maximum sensible offset without the chain being too bent – what I observed when actually riding the bike. It is slightly different to the usable gears I listed above and it shows 15 usable gears, not 12. Some will probably be the same ratios as others so my sequence of downchanges might need revising. 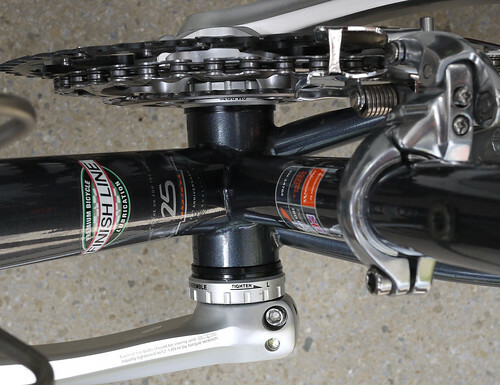 As Chris says, my Ridgeback Panorama has a HollowTech II bottom bracket with external bearings. 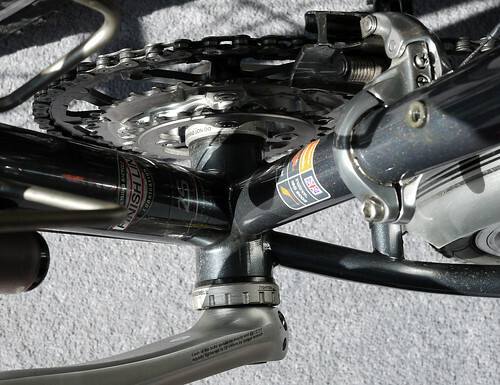 There are two spacers between the BB shell and the right side bearing and only one on the left, so the chainline is pushed outboard (as in the diagram) and the right pedal is further outboard than the left. I'm not sure why it should be. For the front mech perhaps. This answers Chris's question why I use only the three smallest sprockets from the large chainring: it's because the chainset is further outboard than the cassette. If I moved the extra spacer over to the left side of the BB, everything would be more in line but the Tiagra front mech might not work properly. Cycling as you describe, using only three cogs with each chainwheel is the exact predicament I found myself in when at the last minute I put a new 8 speed chain on my 9-speed touring/ATB for Lejog, in 2009. I couldn't use more than three on each chainring because of rub. Once I got home I put on a 9-speed (didn't have one handy when I was leaving) and it fixed the rubbing. Being this restricted on Lejog drove me mad!! Forget about the crossing over and use them so long as they don't rub! I tour now on a Roholff equipped bike which gives me 18-90+ inches. That's ideal for me. I used an 11-32 and 42, 32, 22 on my previous ATB tourer and the same on my Dawes Galaxy before it died. When I began touring I had a 52, 38 and 12-32 setup and it was not adequate for severe stuff though I was young thin and very fit at the time. For years the standard touring setup on the British Eagle Touristique I had, was as I recall a 48 38 28 and 11-28 setup. That gave a lowest gear of 27inches which was enough for everything if you were able to pedal slowly enough, which I can. But I prefer about 18 for my lowest gear. Only with the large chainring. It's because on this bike the crankset is at least 1 centimetre further outboard than the cassette. I think excessive crossover is best avoided – more wear on the chain and chainrings and also less efficient to pedal. Anyway – for what it's worth – I now have an optimal sequence of shifts through the gears but it requires concentration to remember that when you shift from one chainring to another you also shift a sprocket in the opposite direction. Worth doing. The pedals are now the same distance from the centreline. I don't know why the Shimano instructions tell you to put the 2 spacers on the crankset side (on Hollowtech II bottom brackets).